Maria has practiced in the areas of Natural Resources, Environmental and Utility law for over twenty years. 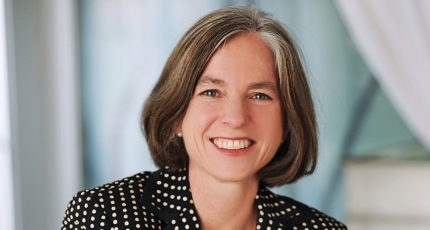 Her primary focus is on water resources, water quality, and related regulatory matters including National Environmental Policy Act (“NEPA”) and Endangered Species Act (“ESA”) compliance. She represents clients from both the public and private sectors before the Office of the New Mexico State Engineer, the New Mexico Public Regulation Commission federal agencies, and in state and federal court. Maria’s experience has been centered on resolution of complex disputes regarding water use and allocation. Her experience includes negotiation of multi-party water agreements, permitting of water and energy projects, the purchase and lease of water rights, water utility matters, litigation involving protection and acquisition of water resources, water planning and water quality issues. 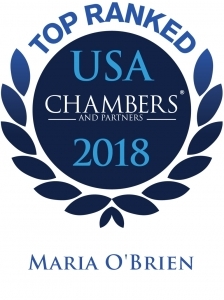 Chambers USA has recognized Maria in the area of Water Law, and reported in 2018, “Maria O’Brien ‘has an excellent legal mind and is great at dealing with clients. She is very collaborative and a great problem solver,’ say sources. 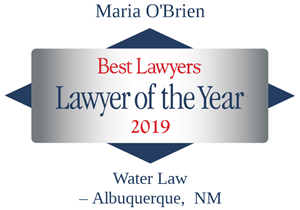 O’Brien is widely acknowledged as a top choice in water law matters, including water quality and water use and allocation disputes.” Maria has been selected as “Lawyer of the Year in Water Law – Albuquerque” by Best Lawyers of America® three times, and has also been recognized by Benchmark Litigation and Southwest Super Lawyers®. Maria regularly addresses a complexity of issues relating to water supply and related regulatory matters regarding the permitting and siting of energy and water projects. Maria currently represents the State of Oklahoma with regard to conflicts over water resources as between the State and several Oklahoma Indian Tribes. She represented the City of Albuquerque (now the Albuquerque Bernalillo County Water Utility (“ABCWUA”) ) in protection of its municipal water supply with regard to ESA claims involving the endangered Rio Grande Silvery Minnow. She continues to represent the ABCWUA on ESA and water quality matters. She represents the Pueblo de Pojoaque in the context of the Aamodt general stream adjudication, which involves the water rights claims of four Pueblos, various governmental entities and thousands of non-Indian defendants. She participated in the decade-long effort to draft a settlement agreement which received congressional approval and funding and was signed into law by President Obama as the Claims Resolution Act in December 2010. She continues to work with the Pueblo on implementation of the settlement including approval of the Partial Final Decree for the Pueblo rights. Prior to joining the firm, Maria served as law clerk to the Honorable James A. Parker of the United States District Court for the District of New Mexico. Maria previously served as Head of the firm’s Natural Resources and Environment Department and was long time Chair of the Water Resources Group and former Chair of the Energy & Utilities Group. Maria is an avid runner and hiker. When not lawyering or running, she spends time with her two children, husband of 27 years and three Rhodesian Ridgebacks. Representation of the State of Oklahoma with regard to litigation and negotiations relating to the water claims of the Choctaw Nation of Oklahoma and the Chickasaw Nation to water in twenty-two counties in Oklahoma. Representation of El Paso County Water Improvement District No. 1, the Texas and downstream irrigation district in the Rio Grande Project, including in the context of ongoing interstate litigation Texas vs. New Mexico, No. 141, Orig. Representation of the Pueblo of Pojoaque in the settlement of Indian claims in the longest running federal court case in the country. A settlement agreement was enacted into law when it was signed by President Obama on December 8, 2010 as the Claims Resolution Act of 2010. Continued representation of the Pueblo on implementation of the settlement related to water and environmental matters. Ongoing and long-term representation of several municipalities and regulated water suppliers including the City of Carlsbad, City of Rio Rancho, and New Mexico Water Service Company with regard to water planning, acquisition and negotiated and litigated water supply matters. Assisted numerous energy projects with water and siting related matters as well as continuing to advise BHP New Mexico Coal Company on all of its water matters related to its coal mining operations in the San Juan River Basin. Panel Discussion: “State Management of Groundwater: Perspectives from New Mexico and Colorado”, Law of the Rio Grande Conference “Protecting and Enhancing Our Water Resources,” April 6, 2018. Testimony before Senate Indian Affairs Committee on behalf of Western States Water Council, March 15, 2012, oversight hearing on Indian Water Rights; promoting the negotiation and implementation of water settlements in Indian Country.